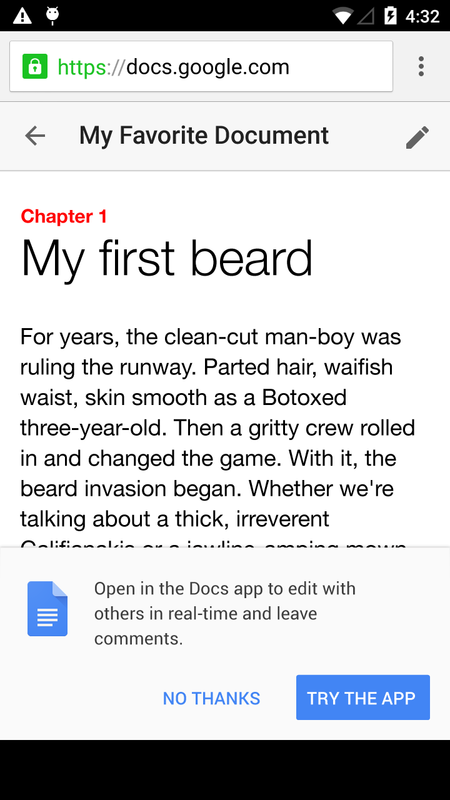 Google Drive for the mobile web has always restricted editing to just Docs files — attempting to edit Sheets or Slides files required downloading the Google Drive app for iOS or Android. That changes today. No, you won’t be able to edit Sheets or Slides files now, but rather Google is also killing off the editing capabilities in Docs for mobile web. The change makes total sense, if for consistency at the very least. But Google says it’s because the Drive native mobile app is “easier to use and offers more robust functionality.” Native apps typically have more access to the hardware and system-level software capabilities of the devices they’re installed on than web apps, and since they are downloaded directly onto the device, much of the boilerplate user interface doesn’t have to be loaded from the Internet each time the user goes to use them. From now on, when a Drive user opens a Docs, Sheets, or Slides document from the mobile web, they’ll be presented with one of Google’s new app install banners that make it easy to launch or download the native app, and then be taken directly to the file they were initially viewing in the browser. Tapping the pencil icon in the top right will also trigger the banner to appear. The user interface across the mobile web viewers for the three aforementioned editing tools have also been cleaned up to create a more consistent experience, which is nice.